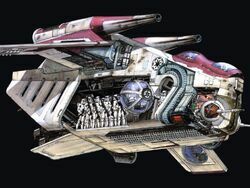 The Low Altitude Assault Transport (LAAT), Republic Attack Gunship called by the clone troopers who used it, is a gunship type airship used for air-based support and infantry transportation on the battlefield. Able to easily navigate through rough terrain and transport an entire platoon of clone troopers they where used in countless missions. Armed with laser cannons on the side and wings of the ships they where greatly feared in battle. The gunships missiles launched from the twin launchers above the ship provided many benefits in the battlefield as well, the missiles where able to navigate around obstacles and caused added damage upon impact. Because of this there where mission specific missiles. Capable of carrying up to thirty clone troopers these ships where widely used in battles during their production. Their main uses are reconnaissance, direct fire support, search-and-recovery, and low-altitude air-to-ground and air-to-air strikes against enemy vehicles, troops, and bases.